To round out our beauties this week, the lovely Miss Guida. She’s a little on the sleepy side but still happily flapping and enjoying her dinner. Guida loves areas like this. 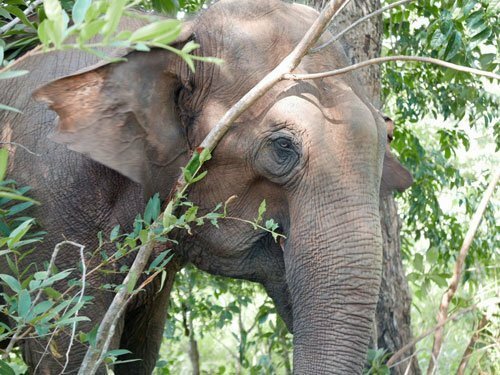 When she and Maia walk somewhere together, Maia will stay on the road, but Guida prefers to venture slightly off, walking instead through the woods. She ends up in the same place, she simply likes to mosey through the saplings, picking vines and individual leaves and stopping at some of the magical little-hidden pastures that can be found throughout. This specific area is a favorite of everyone and one of the first places we look if any of them are MIA at dinner time. I love hearing about the elephants adventures. They make me happy! I’ll never forget the old footage of Guida chained and swaying, this must be heaven for this lady , and the gentle care she receives. Bravo! !